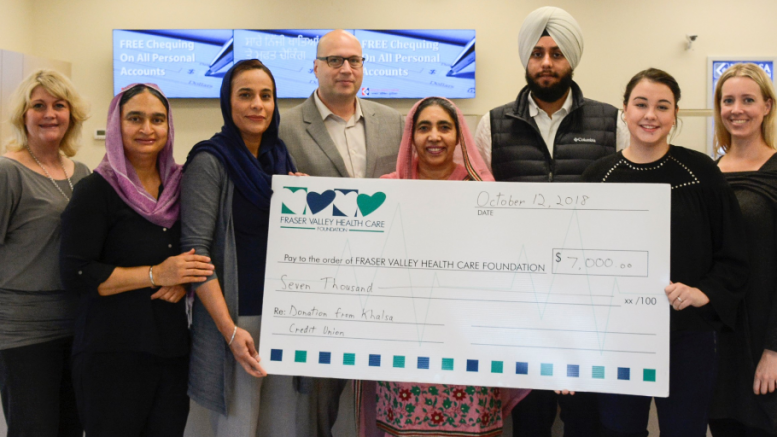 Abbotsford – Khalsa Credit Union recently made a $7,000 donation to the Fraser Valley Health Care Foundation that will go towards two regional mental health programs for youth: the Adolescent Day Treatment Program and the Early Psychosis Intervention Program. Left to right: Shannon White (EPIP/Fraser Health), Kulwant Bansi (Khalsa Credit Union), Harloveleen Dhillon (Khalsa Credit Union), Jason Lesage (Fraser Valley Health Care Foundation), Baljinder Brar (Khalsa Credit Union), Himmat Sidhu (Khalsa Credit Union), Taylor Barr (ADTP/Fraser Health) and Lisa Healy (ADTP/Fraser Health). Be the first to comment on "Khalsa Credit Union Donated $7K Towards Two Regional Mental Health Programs"